This is my book blog, where I review books I read as part of Cannonball Read 11, where participants compete to be the first to reach 52. We also try to get people excited about books and reading, and make money for cancer charities. Just after Christmas 2016, my cousin died of lung cancer and in early 2017, my godfather also passed away. I'm balancing being the mother of a little boy with my job as a teacher, but hope to manage my goal of 104 books by the end of the year. Wish me luck! Another year has come to an end (at least in my time zone). At the start of 2018, I was genuinely not sure how much I'd be able to read, and certainly not if I was going to find enough time to review much. This time last year, I was pretty heavily pregnant and on sick leave from work because of my pelvic girdle pain. I had a c-section at the beginning of February, where I had complications during surgery, leading to a slower recovery than many have, as well as anaemia for about two months. I gave birth to a very sizable baby boy and keeping him alive and happy has been both mine and my husband's number one priorities. To begin with, I listened to a lot of audio books while I nursed the baby both during day- and nighttime. As my attention span was a bit shot, I mostly relied on comforting re-reads. I also bought a Kindle (my faithful Sony Reader didn't have a backlit screen), which enabled me to read without turning on the lights, so as not to disturb the husband or the baby during the night. Being unsure of how much I'd manage to review, I signed up to the Cannonball Read for a measly quarter Cannonball (13 books). In the end, I surpassed all my expectations and not only finished a double Cannonball (104 books), but ended the year with 108 books reviewed. I was even in the top 10 for the whole year, something else I certainly hadn't expected. Being a Mum is wonderful, weird, demanding and occasionally rather boring. We've been incredibly lucky, our son is a mostly very cheerful and sociable little dude. Until he was around five months old, he slept a lot and he's usually never cried much, except when he's hungry, tired or in pain. Once he started teething at around six months, his sleep patterns got a bit more erratic, but thanks to the wonderful Alexis Dubief (author of Precious Little Sleep and my online friend), we got him sleep trained when he was about nine months old. Now, barring very few exceptions, he sleeps through the night in his own room and I get a chance both to read more before bed, and sleep for longer stretches of time without having to nurse him. I went back to work full time as a secondary school teacher in early November, having been away for more than a year. While I'd been promised a fairly gentle start, things rarely go according to plan, and instead I was thrown in, off the deep end, one day before the end of term tests started. So many new kids to get o know, names to learn, not to mention piles and piles of essays to correct and grade. For the first month, I was pretty much exhausted by the time I got home every afternoon, and had to fight not to fall asleep while waiting for dinner. By Christmas, it was getting better, but it's still a time-consuming and challenging job, and juggling it with motherhood to an almost toddler (he can pull himself up against the furniture and cruise along now, constantly reaching further along tables and shelves) takes a lot of my energy. In non-reading, not making a new human news, being new parents have given the husband and I a lot of excuses to watch a lot of TV and movies. Like for any right-thinking human, The Great British Bake-Off and Netflix' Queer Eye have been amazing shows for soothing my soul and helping me briefly forget all that is sucky in this world (and there's so much - just when you think 2018 couldn't get suckier, it kept just getting worse). Thanks to Oslo cinema's baby friendly matinee screenings, I watched more movies in the first half of the year than in a very long time. Particular highlights were Black Panther, Coco, Love Simon and The Death of Stalin. In September, I got to go see Crazy Rich Asians in New York with my BFF, and it's one of those rare adaptations that's just SO much better than the book. I am ALL for the return of the romantic comedy, with Netflix helping the cause along nicely with good comfort movies like Set It Up and To All the Boys I've Loved Before. When it comes to TV, one of the surprising highlights of the year was the second season of Netflix' Iron Fist. I didn't even watch the first season, and found the character mostly annoying on the ensemble show The Defenders. Neither the husband, nor I had expected to enjoy it as much as we did. Of course, then Netflix promptly cancelled it. I also got very into The Magicians, which I avoided for many years because I really didn't like the books. Now it's one of the shows I most look forward to returning in 2019. Typical. Bob's Burgers and The Good Place continue to be great. Westworld season 2 was a huge disappointment (I tried SO hard to like it). Likewise the most recent season of Doctor Who. I wanted the first female Doctor to have a good run, but Chris Chibnall just isn't up for the job, and while Jodie Whitaker is delightful, she's not given a lot to work with, and after the season is concluded (with the exception of the New Year's special tomorrow), it's just not very good. Having three companions means neither one gets the focus and attention they deserve, and even though the show is more diverse than possibly ever before, cast wise, most of the serious emotional character development was given to the middle aged white guy. Riverdale hasn't just jumped the shark, it's pretty much taken off into space. I stopped watching after about four episodes and now only read the increasingly more ludicrous plot summaries. As well as having and raising a baby, we had our traditional Norway day visit from my BFF Lydia, her husband Michael and their two boys in May. Just before they came, baby Moomin had his first trip abroad, when we went to London for a long weekend. Long before I got pregnant, I had pre-ordered tickets to Hamilton: the Musical, which was possibly even better than I had hoped for or imagined, possibly because I already knew all the songs and seeing it all on stage, performed by an excellent ensemble was just beyond my powers of imagination. We caught up with old friends, as well as had an afternoon together with my parents- and sister in law and our two nieces, who came down to London for the day just to see us. My parents in law have also visited us here twice, doting on the grandson. In September, we took advantage of the fact that I was still on maternity leave and my husband can translate just as well in the US as in Norway, and spent three weeks with Lydia and family in New York. During that visit, we also spent nearly a week in Canada (new country!). The whole trip was excellent, but as the baby turns into a toddler, it's getting more challenging to fly with him, and we'll have to see how much we will be taking overseas trips with him in the year to come. Back to books, every year since 2008, I have logged all the books I read (and re-read) and tried to keep track of how many books and pages I read. I keep super nerdy statistics for myself, and use them to try to challenge myself to diversify my reading more. I try to read a hundred "new to me" books each year. Only two of the years from 2008 to 2017 did I read fewer than 50 000 pages over the course of the year. Until 2018. To be fair, this year has been an absolute garbage fire and the endless cycle of super depressing "we're all going to die" news can make anyone depressed and super anxious. I discovered while pregnant that I simply could not handle anything too challenging or dark when it came to my reading. Peril to or the death of children - big ol' nope. That continued into 2018. The reason I didn't manage my goal of a hundred new books is that I consciously chose to re-read a lot of books, old favourites I knew were "safe". In the latter half of the year, I still got some proper challenges, as the Cannonball Read launched their first Book Bingo. Pretty much all of my "worst of the year" books were read while working to complete that Bingo Card. Not only did I complete it, and had a lot of fun doing so, but I won a prize - a signed copy of Bellweather Rhapsody. 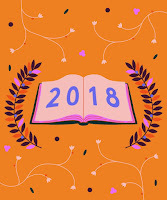 I got 223 new books in 2018. 189 were e-books, 21 were audio books, 15 were physical books (9 of those were comics/graphic novels). Of the 223, five were gifts and eight were freebies in other ways. Of the books I read, 80% were by female authors, a mere 4.5% were by male authors and 17% were by a husband and wife team (Ilona Andrews - yes, I read a LOT by them. I can't help it if their books are awesome). 25% were by persons of colour. I would like for that number to be higher next year. With the exception of the Cannonball Read Bingo, I didn't really complete any reading challenges this year. I kept a few lists for my own amusement, but didn't officially sign up for anything. Sadly, only 18% of the books I read were books I already owned before 2018, and I need to be better about that next year. 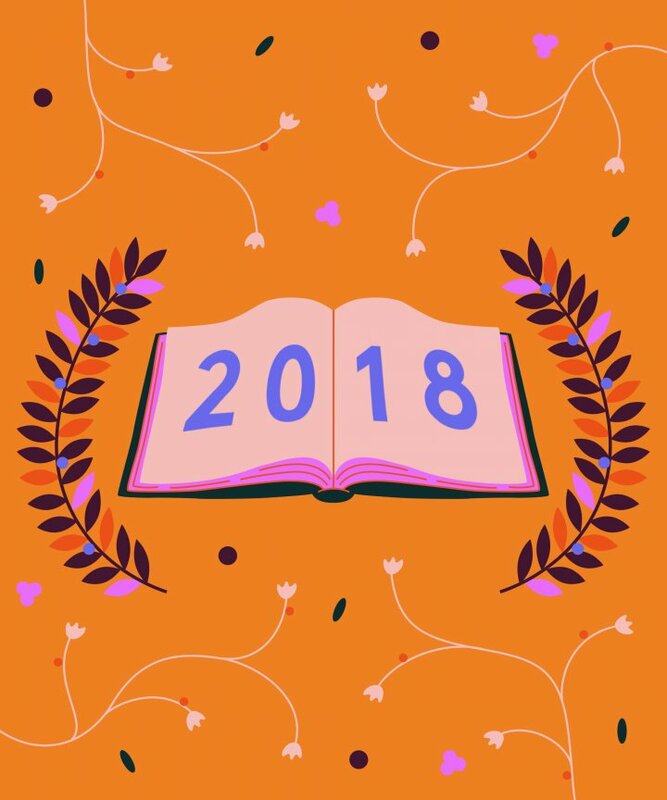 Last year, I did a top ten best books of 2018, and another top ten for books published before that. I don't feel like I've read enough new books this year to do that. My top ten will include both books published this year, but mostly books published earlier than that. I've also included five books in my honourable mentions, they were good, but didn't quite make the cut into the top 10. Hamilton: the Revolution by Lin-Manuel Miranda and Jeremy McCarter. I finished this rather impressive tome the night before we flew to London, which seemed very appropriate. Reading about the process of writing and staging the musical while getting ready for and anticipating the seeing the show was great. This book has won a bunch of awards, I don't need to tell you how good it is. Kindred by Octavia E. Butler. Is this book of speculative fiction science fiction? Is it historical fiction? Is it magical realism? It doesn't really matter. I've had this book on my shelf for several years, knowing it was probably going to be good, but a bit too daunted to give it a chance. Luckily, the Cannonball book club gave me the push I needed. Absolutely one of the more "difficult" and at times unpleasant books I read this year, where I mostly tried to read only safe, fluffy books. Absolutely excellent. All Systems Red by Martha Wells. I also made the acquaintance of Murderbot this year. The winner of several awards and huge amounts of critical acclaim, Martha Wells' sci-fi novella about the misanthropic and introverted security android, who hacked their own programming and only wants to be left alone to consume entertainment is one of those things I didn't know was missing in my life. I still have three more novellas to read about Murderbot's adventures, and I can't wait. Eliza and Her Monsters by Francesca Zappia. This young adult novel about creativity, fandom, web comics, friendships, difficult family relationships and love is one of the novels that really surprised and touched me this year, and it's one of the books that have really stayed with me in my memory. Such a lovely book. Iron and Magic by Ilona Andrews. Something that started out as a joke for April Fools' Day a few years ago became one of the most surprising and enjoyable reads of the whole year. Taking one of the biggest villains of their Kate Daniels series and turning him into a credible romantic hero, without really ret-conning or downplaying some of the horrible things he's done in the past is a remarkable achievement. If anyone could do it, it would be Ilona Andrews, though. Magic Triumphs by Ilona Andrews. Another achievement from this husband and wife writing team, they finished up their long running paranormal fantasy series with the tenth and final book. I've seen some people being disappointed and let down by the ending, I thought this was a very good conclusion to possibly my favourite paranormal/urban fantasy series for the last few years. The Hate U Give by Angie Thomas. This book had been on my TBR list pretty much since it came out. I knew I was going to have to read it eventually, and I knew it was going to mess me up when I did. The trailer for the movie adaptation had me in tears (not going to go see it in the cinema, that's for sure) and this book turned out to be just as impressive and important as I had expected. I'm going to be using this to help me illustrate #Blacklivesmatter in class in years to come. The Long Way to a Small Angry Planet by Becky Chambers. For someone whose stats show that she read less than 5% sci-fi this year, there sure are a disproportionately high number of sci-fi books in my top 10. It's been said that Chambers writes "cozy" genre fiction, and I can absolutely get behind this description. A great cast of characters, not too much focus on the space or the technology (which tends to be what bores me). I can't wait to read more from her. Josh and Hazel's Guide to Not Dating by Christina Lauren. It's not been a great year for romance. I don't think any of my standard favourites delivered a book that will really stay with me, and there were quite a few books that were merely OK or fine, none that really blew me away. This book was sweet and funny and entertained me more than pretty much all the other romances I read and had a very good slow burn romance at the centre. Tante Ulrikkes vei by Zeshan Shakar. This book has been a publishing sensation in Norway since it came out, and I'm not surprised, as it's a very important novel in a country that is still so predominantly white and privileged, struggling to integrate its immigrant population in a good way. The young men at the centre of this book rang entirely true to me. I have seen many of them in my classroom over the years, and it will go badly for the country if we don't adapt and give them the futures and opportunities they deserve, on equal footing with "those who were here first". The Sins of Lord Lockwood by Meredith Duran. Not your traditional cozy historical romance, there is a lot of pain, angst and mutual recrimination in this book. I very much enjoy Duran's usually slightly darker take on historical romance, and this one didn't disappoint. When Dimple Met Rishi by Sandhya Menon. This YA novel about a couple of Indian teens whose parents want them to marry meet up and are forced to work together at a programming camp in San Francisco. Dimple rebels against her parents' expectations, Rishi is, initially at least, quite happy to accede to their wishes. Dimple wants to hate Rishi, but of course can't, because he's adorable. Heroine Complex by Sarah Kuhn. The third and final book in this trilogy came out this year, which finally gave me the motivation to read the series. This first entry is absolutely the strongest of the three, about female superheroes in San Fransisco. A funny, exciting, empowering read about diverse and interesting women. Running Like a Girl by Alexandra Heminsley. I would not have believed that a non-fiction book about marathon running was going to be one of the most enjoyable books I read this year. While I doubt I will ever become a runner, this book made me understand why some people find it such a rush, and keep doing it, even when they can get horribly injured along the way. Wicked and the Wallflower by Sarah Maclean. After several rather disappointing books in a row, Maclean finally wrote a historical romance I really enjoyed again. She even made the "I shall use this woman to get revenge on another dude" trope work in her favour, mainly by having a heroine who was more formidable than either of the guys wanting to use her. Kilmeny of the Orchard by L.M. Montgomery. Anne of Green Gables and The Blue Castle are lovely books that have given me much pleasure. When I had to find a book that was more than a hundred years old, it seemed like a stroke of luck when I found this one (which is also in the public domain and therefore free). Oh no, it's absolutely awful. A horrible protagonist, a dreadful "heroine", sexism, racism, as well as a mostly very unremarkable and dull plot. A Duke by Default by Alyssa Cole. I probably wouldn't have rated this so low, if so many other people and review sites hadn't been so impressed with it. I was expecting great things (and the cover is so pretty) and instead I got a badly researched mess of a book, with a deeply dislikable hero, a veritable Mary Sue of a heroine, annoying Scottish "vernacular", the promise of sword making (which was never delivered on). Seriously Ms. Cole, you could have written a better book after a ten minute Wikipedia search. The Dud Avocado by Elaine Dundy AND Between the Bridge and the River by Craig Ferguson. The Cannonball Read is basically founded in memory of AlabamaPink, who died of cancer before she was able to complete the first one. What this year has shown is that based on the few books she managed to review before her passing, we have vastly different taste in reading material, and I will be happy if I never have to read anything from her list ever again. I'm especially disappointed in the Craig Ferguson novel, because I was one of the people who voted for it for Book Club, since I'd enjoyed his autobiography so much a few years ago. 29 / 52 books. 56% done!